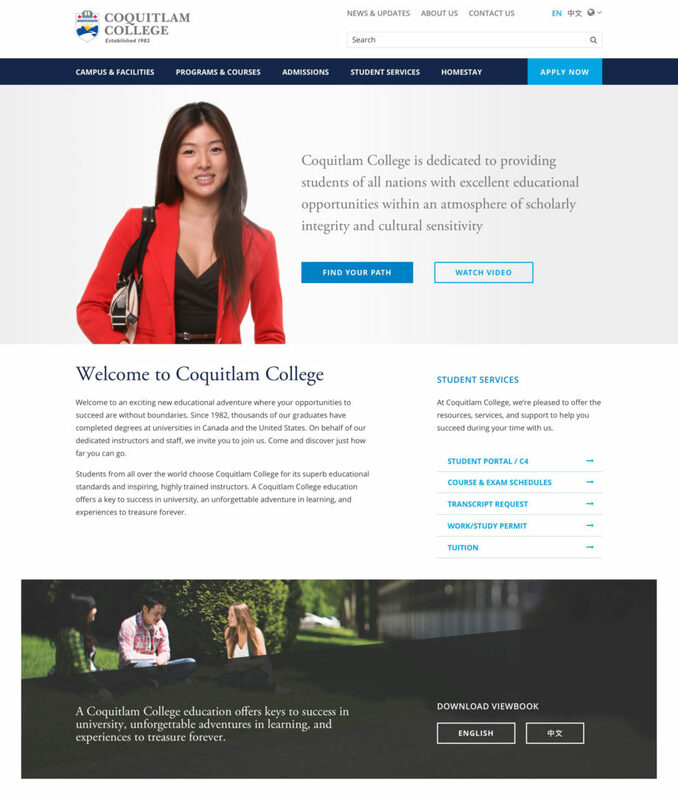 With over 30,000 graduates Coquitlam College is one of Canada’s finest colleges. Students from all over the world choose Coquitlam College for its high educational standards and inspiring instructors. For 35 years Coquitlam College has developed and refined academic programs in English language studies, business, art, science and humanities offering keys to success and encouraging students to pursue broad academic goals. However their website wasn’t reflecting their strategic excellence, it wasn’t easy to navigate and had an inefficient layout. They needed a new website aligned with their goals and values with improved usability, engagement and overall flow. At SplitMango we know that a well-designed information architecture is the foundation for an efficient user experience. A crucial part of redesigning their website was improving the content structure and navigation. At SplitMango we know that a well-designed information architecture is the foundation for an efficient user experience. 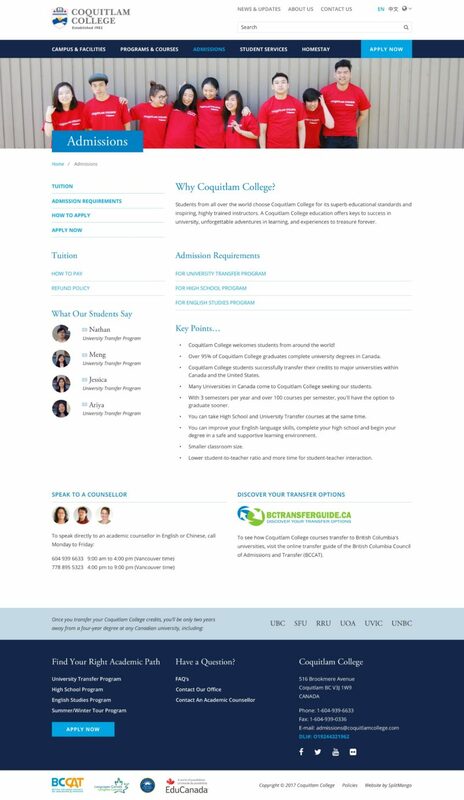 We worked closely with the team at Coquitlam College to reorganize the substantial amount of content and restructured their content to create a more intuitive navigation along with online tools that make user’s and administrator’s tasks easy to complete. Graphic elements, functionality and navigation were built according to the information architecture solution. Remaining on brand, we used bright colours and a positive use of white space to create a fresh, clean and approachable interface. While analyzing their old website, we found numerous places where content was manually updated to match their course registry records. We also found that their registry was limited to modifications and could not support the extra data that was needed for the redesign. To address these issues, we built a custom application to mirror their course data and extend it to support more data. We used the Laravel PHP framework for its capabilities in building robust APIs and effective tooling to create a custom admin panel for managing the data. We also implemented a system where the admins would only need to enter codes and identifiers for things like courses and semesters, and the site would build its page content by retrieving all the necessary information from the custom application and registry. This has helped to minimize unnecessary manual work and eliminate errors that could arise from duplicate content. 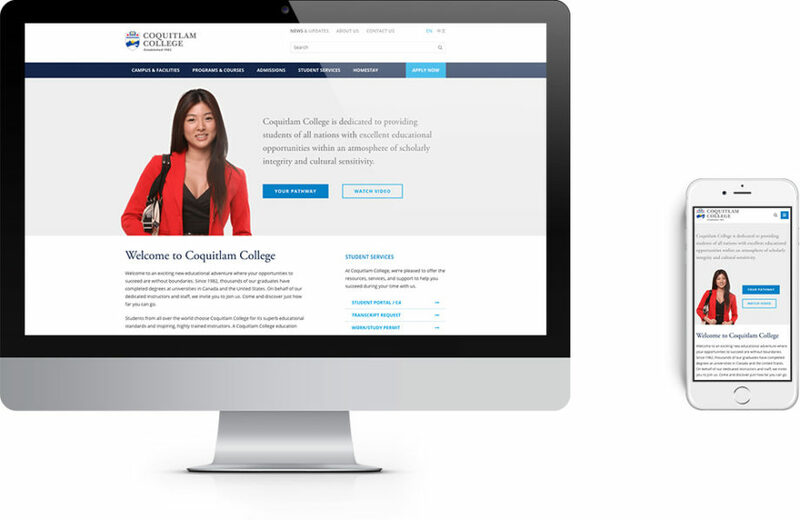 The new Coquitlam College website provides a warm and friendly experience for students from many different places and cultures.